I don’t even know where to start when sharing this special story. This Paradise Cove Orlando Wedding was special to me because the Bride, Brittany, has been a dear friend of mine since she was 17 years old. I can’t even put into words how honored I feel to have been asked to be her wedding photographer and hair stylist. Almost a decade ago, Brittany and I used to work together. I remember so many different occasions where she would share with me her feelings for Shelley long before they were ever even together. I knew that they would one day be together and I could see the way Brittany adored Shelley when she would light up every single time she talked about her. I’m pretty sure I encouraged her to pursue the relationship several times along the way. I remember our first skype call together when I got to talk wedding details with the happy couple, and I was so excited for their upcoming Wedding! When they told me they were having a Paradise Cove Orlando Wedding, I immediately looked up the venue and couldn’t wait to see it in person. It was super gorgeous! When their wedding day finally arrived, I greeted the girls in the Beach House Suite. The room was filled with giddiness and laughter. Her group of bridesmaids were truly a dream to spend time with and help her get ready. During the getting ready time, Brittany was surprised unexpectedly with a gorgeous bouquet of flowers, a love letter and champagne from Shelley. She cried, and I almost did too! Together, Brittany and Shelly have great energy. I love how they balance each other perfectly. And they are so much fun! They made their ceremony truly unique by having Shelly arrive via speed boat from the lake that sits behind there ceremony spot. She walked off the boat and into her parents arms to the song Paradise City by Guns and Roses. It was epic. By far one of my favourite ceremonies to date. The ceremony was dreamy and full of joy and laughter. 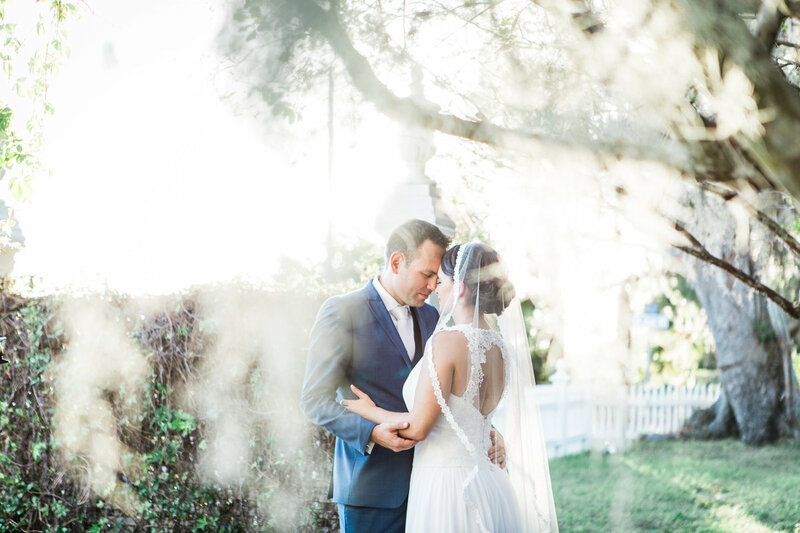 Their December wedding made for the most beautiful Florida weather on their wedding day. Truly perfect for their special day. One of my favourite parts was getting to spend some quiet, intimate time alone with the couple capturing their formal portraits as a newly married couple! Paradise Cove sits on a beautiful lake and it was still as glass which made for the most superb backdrop for their photos. Their reception was a blast too. Once the party started, it never stopped. From Shelley’s grand dance moves during the garter retrieval, the awesome conga line with all their guests, and their glow stick send off, they planned one amazing party for their friends and family. It was truly awesome. I even got out there with the Bride and joined in on the dancing fun a bit. These two are amazing. It brings tears to my eyes writing this. Here’s to you two! May you have many blessed years together. Thank you for being not only my clients, but more importantly, my friends. Love these shots! We’d love to feature them on our fb and blog. If you’re able to share some floral highlights please email at your convenience. Absolutely, I would love that. I will share some of the floral highlights with you too!